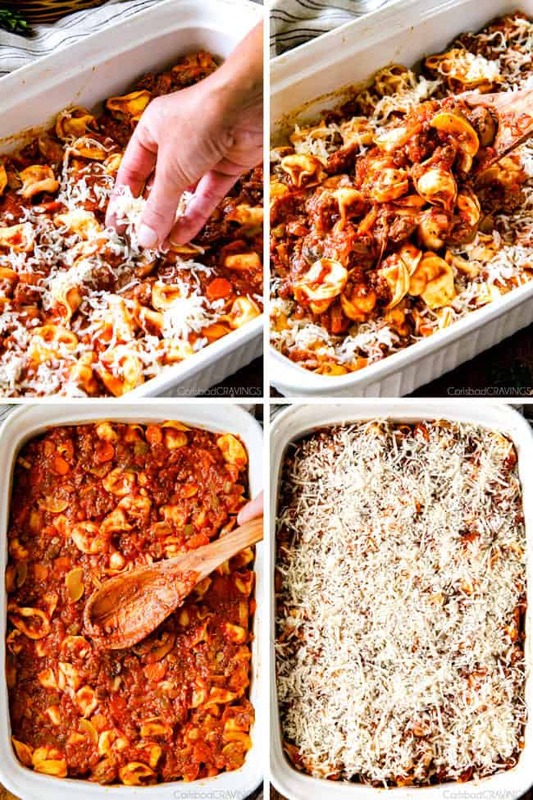 This Tortellini Al Forno (Bake) is one of my all time favorite pastas ever loaded with cheesy tortellini and incredibly flavorful Bolognese sauce! Tortellini Al Forno is a MUST MAKE if you love pasta. 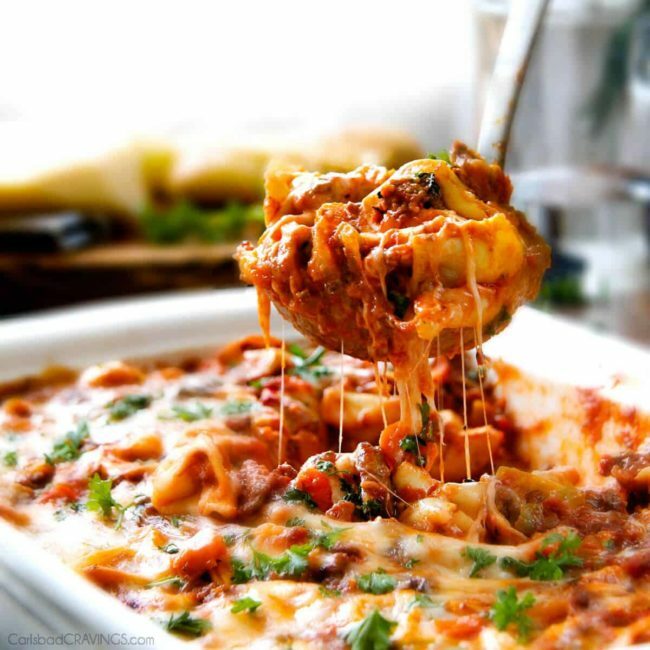 It is hearty, comforting and the layers of cheesiness can’t be beat! 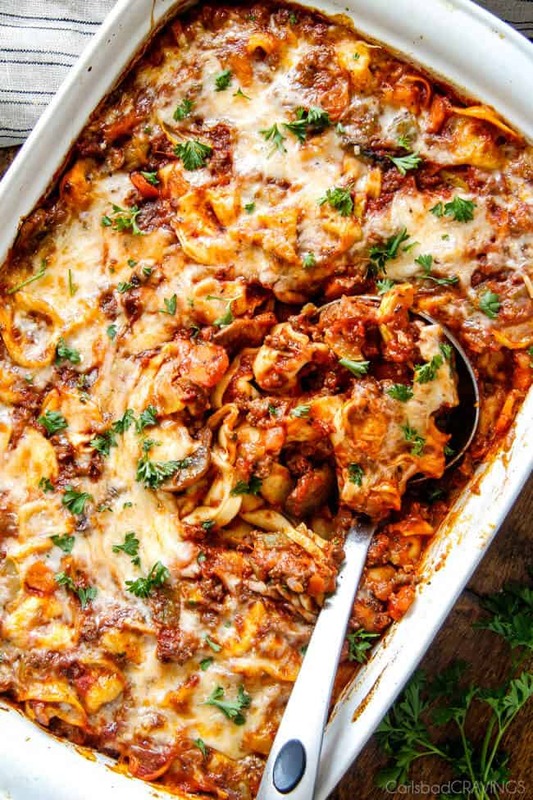 I can pretty much guarantee that your whole family (you included) will go crazy for this pasta! 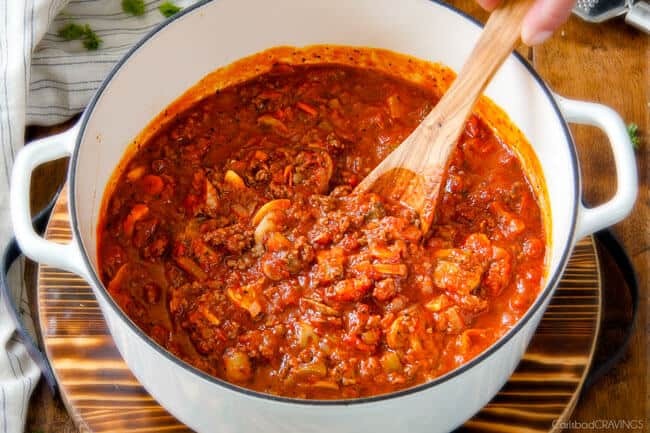 If you love Italian food as much as me, you know there are a few Italian recipe staples you need in your back pocket such as Classic Lasagna, Chicken Parmesan, Italian Meatballs, Spaghetti Bolognese, Sun-Dried Tomato Pasta, Shrimp Fettuccine, and of course, my famous Million Dollar Mac and Cheese. But did you know Tortellini Al Forno is also an Italian Staple? Al forno is Italian food that has been baked in an oven such as pizza, bread and of course, pasta. 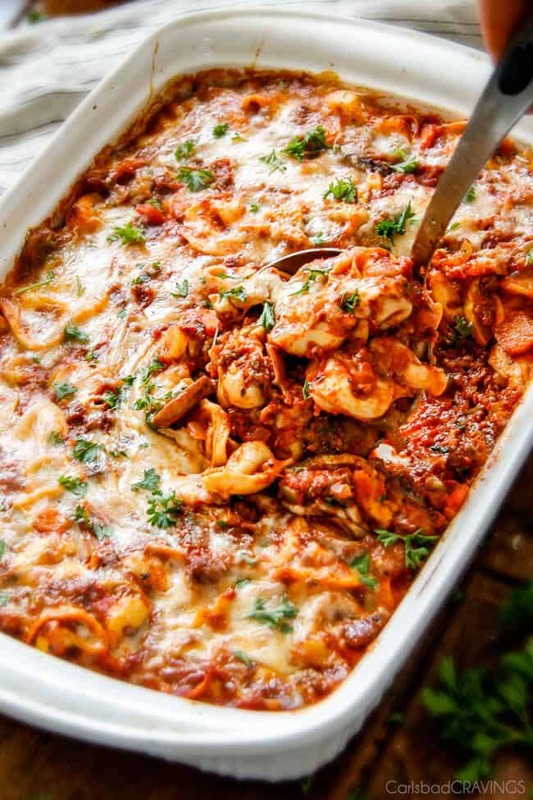 Tortellini Al Forno is tortellini smothered in sauce then baked in the oven and this Tortellini Al Forno is perfecto! 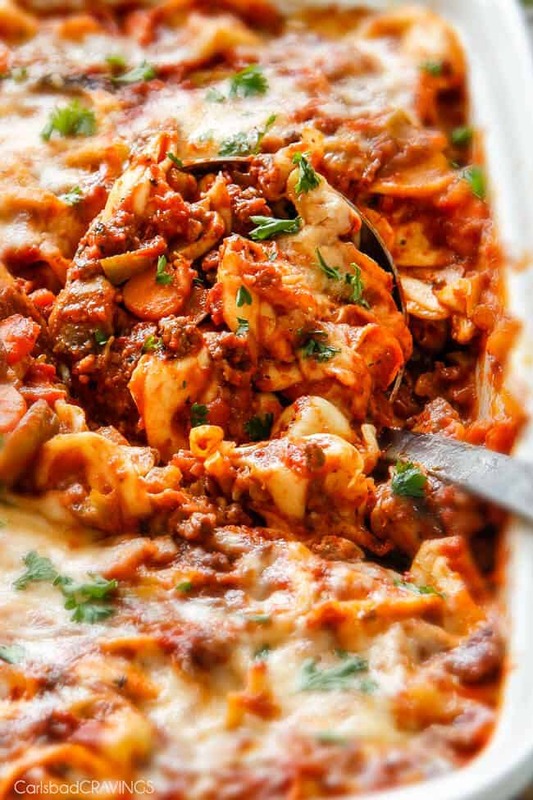 I feel like I’m breaking the rules by posting a this Tortellini al Forno casserole in August. After all, its one of the hottest months of the year but after all these grilling recipes, I am really craving some cheeeeese! And let’s be clear, this isn’t just any Tortellini Al Forno. 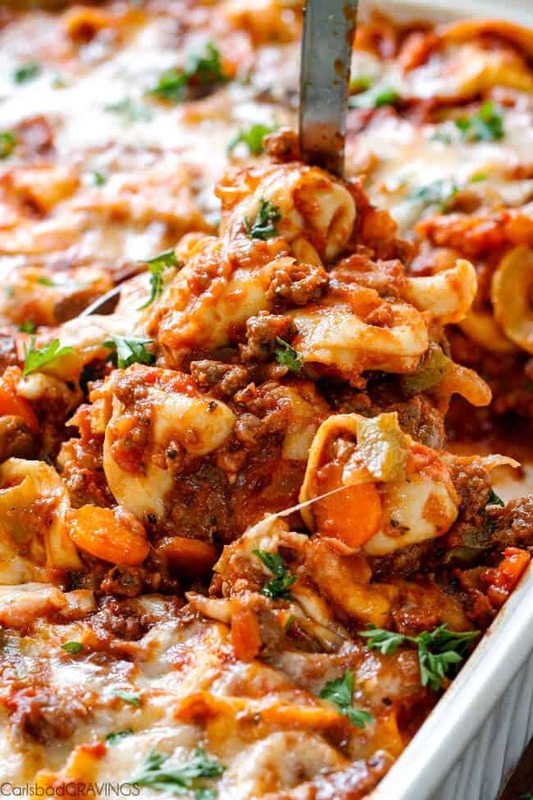 Its not just a cheese tortellini bake, or a vegetable tortellini bake, or a marinara tortellini bake but an ooey gooey, Cheesy Bolognese Tortellini Al Forno – which means it has it all! 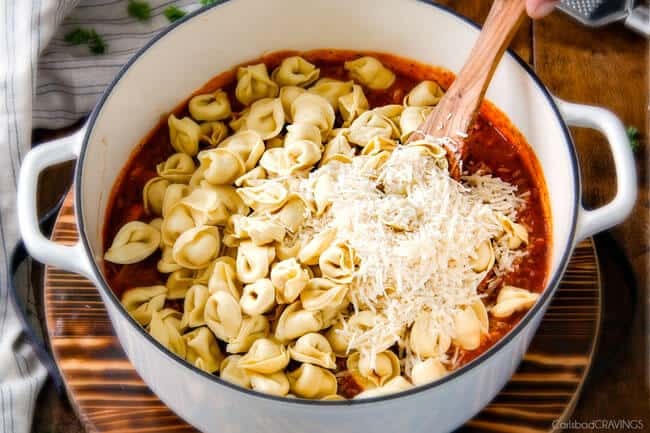 And as you know from my obsession with tortellini from my Chicken Tortellini Soup to my Creamy Tortellini Toscana to my Italian Pasta Recipe with Tortellini to my Creamy White Bean and Ham Tortellini Soup – tortellini makes EVERYTHING better! 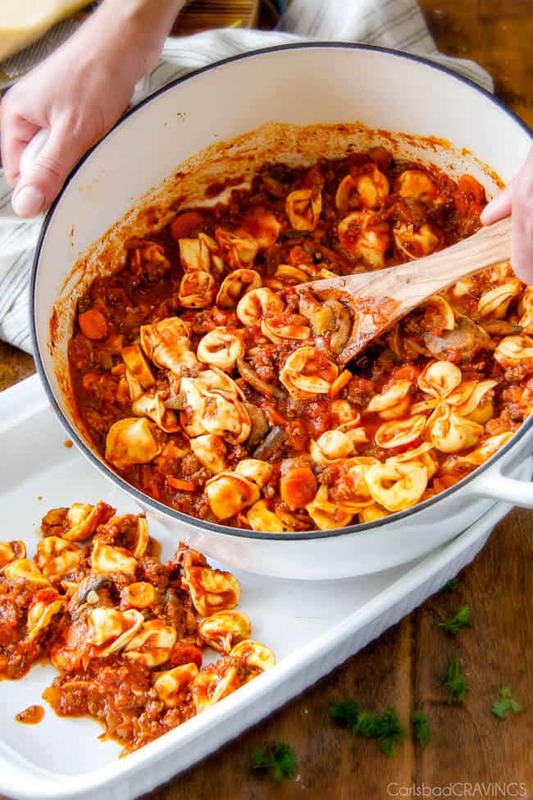 Tortellini will soon have your heart too (if it doesn’t already) with this Tortellini Al Forno. I chose tortellini for this Al forno recipe because the cheesy stuffed pillows are the perfect compliment to the the texture of crisp-tender carrots, green peppers, zucchini and mushrooms, blanketed in a hearty bolognese sauce infused with Parmesan sandwiched in between two layers of mozzarella cheese, topped with more freshly grated Parmesan cheese and baked until bubbly golden perfection. Are you drooling yet? In other words, you and your family of food critics will love this pasta! Once you have browned your meat with your onions and carrots, then you saute your mushrooms, followed by your squash and bell peppers. Top with a layer of mozzarella, the remaining Bolognese Tortellini then another layer of mozzarella and Parmesan and bake to golden cheesilicoiusness. Because I just can’t get enough!!!! Looking for more Italian pasta recipes? 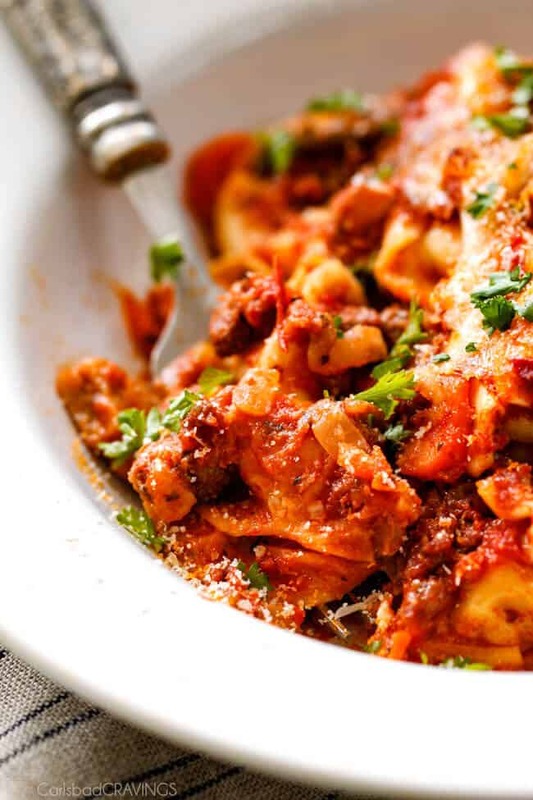 Want to try this Cheesy Tortellini Al Forno Recipe? 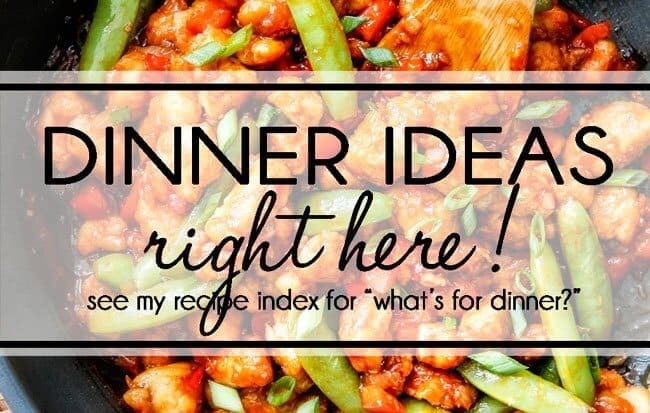 Pin it to your PASTA or DINNER Board to SAVE for later! Heat 2 tablespoons olive oil in a Dutch Oven (or very large pot) over medium high heat. Add meat and season with 1/2 teaspoon salt, 1/2 teaspoon pepper and 1/4 teaspoon red pepper flakes. Add onions and carrots and cook until meat is browned. Add mushrooms and continue to cook for 5 minutes, stirring occasionally. Add squash, bell peppers and garlic and cook for 1 minute. 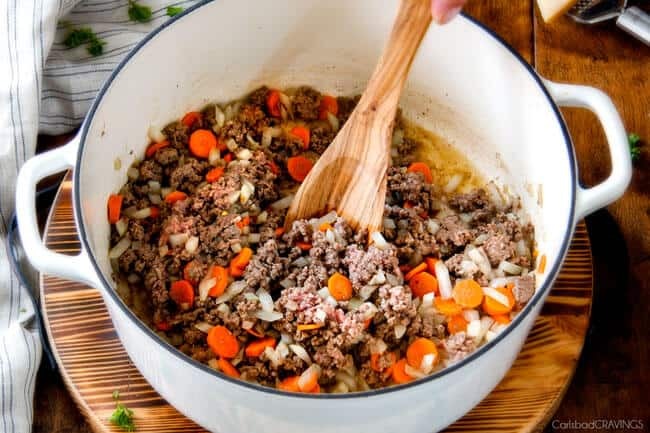 Stir in all of the remaining “Bolognese Sauce ingredients” and bring to a simmer. Simmer gently uncovered for 15 minutes, stirring occasionally. After 15 minutes, discard bay leaf and stir in 1/4 cup milk, 1/2 cup Parmesan and the uncooked tortellini. 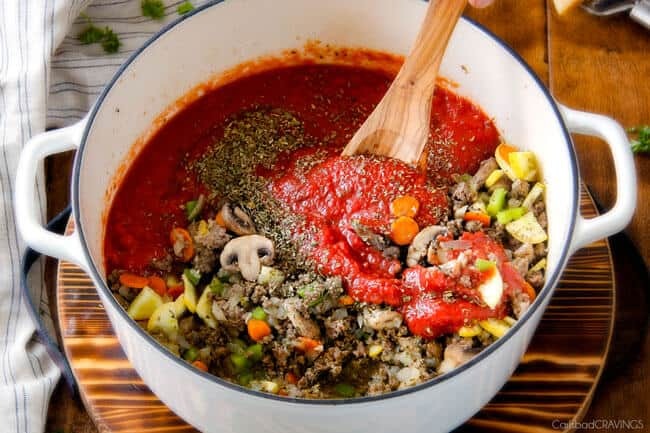 Stir until well combined then pour 1/2 of this Bolognese tortellini into a 9x13 casserole dish. Top with 1 cup mozzarella then top with remaining Bolognese tortellni followed by remaining cheeses. Cover tightly with foil and bake at 350 degrees for 30 minutes then remove foil and broil cheese until golden brown. G’day! Gorgeous, mouth watering photos! YUM! I hear ya, Costco is the best! Thanks for stopping by and enjoy the tortellini! The pictures were enough to get me! 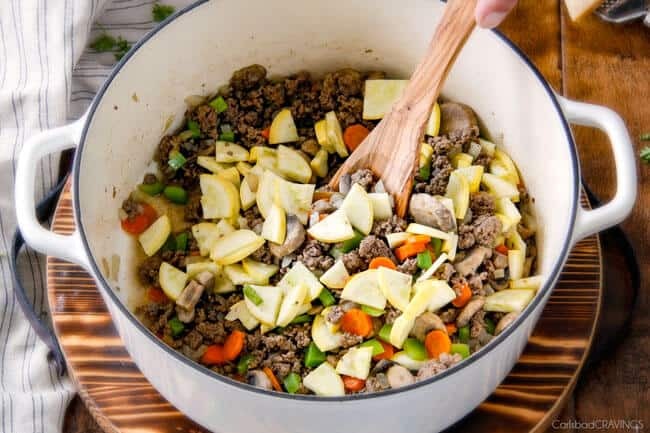 This looks absolutely delicious and it might get my children and (cough) husband to eat some more veggies! LOL! Yes, I think it just might get them to eat some veggies! Good luck, let me know how it goes! Have you been to Italy. I’d love to do a missions trip there. I could “suffer” for the cause. There was a guy in Malaysia who was making gardening systems for the local orphanage… you can really turn anything into a ministry if you put your heart into it. =) Have a great weekend! Hi Meredith! Isn’t it amazing how food evokes memories! That is so interesting how smell is related to memory. I actually have a terrible memory and a terrible sense of smell and I had never put two and two together – until now! I have been to Italy once over a decade ago – I completely fell in love. If I had to choose a favorite of mine, it would be Florence. I would love to go back as well. I think you should pursue the mission trip there to “suffer” for the cause 🙂 You sound like a lovely person, thanks for visiting! We are a cheese family! We like cheese on everything! The recipe looks very good and easy to follow! If you are a cheesy family, you will love this!!! Hope you can try it soon! Wow, this is awesome melted cheese out there… yum! Thanks! Nothing better than lots of melted cheese! This looks delicious…cannot wait to try…I am subscribed to your email posts but have not received this post yet…I tried submitting my email again but I get told I am already subscribed…I check my junk mail routinely for missed emails and it is not going to junk either..would love to get your posts…just do not know what else to try…any suggestions??? Hi Amy, thanks for subscribing to my email updates! I ‘m sorry there seems to be a glitch – I definitely want to troubleshoot this with you. What was the last post you received? This looks so good. 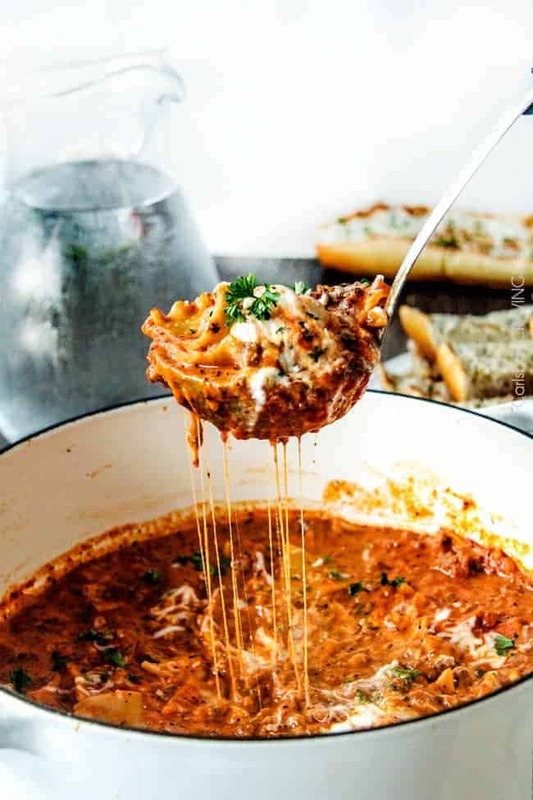 I love that it’s so hearty and cheesy! This would be a great cold weather food, but with all of the veggies, I think it would work well in warmer months, too! Can’t wait to try this. Thank you so much Emily! It is definitely delicious in the winter but I can’t help eating it all year round 🙂 Let me know what you think! Hey, Jen, I made this recipe yesterday for a large luncheon after church. (Actually I made it on Saturday and refrigerated it until yesterday when I baked it). I made a double batch and the only thing I changed was adding yellow squash with the zucchini. Everyone absolutely LOVED this recipe! The taste was awesome, the sauce was fabulous, and the cheesy gooeyness was incredible. Needless to say, we will be making this recipe AGAIN! Thanks so much for sharing. Hi Teresa, thank YOU for your fabulous comment! I feel like this is one of my “forgotten” recipes by readers, so your comment especially made my day! What a great idea to make it the night before to make Sunday so easy – yay! I am SO happy to hear that everyone loved this so much. Thank you Teresa!! If I’m using bagged uncooked tortellini- not the refrigerated/fresh type- would adding a bit of water work or what would you try!? Hi Rachel, yes I think adding 1/2 cup extra water would be a good idea. Enjoy! Hi there! I’m afraid tortellini will become mushy if kept in the crockpot. You could have everything warm and ready to go except the cheese and tortellini and then he would just need to add the tortellini and cheese and let it cook on LOW for about 15-20 minutes. I hope that helps! Would you freeze it uncooked or cooked? I need to make it a week early for a gathering later in the week! Sounds so good!